Governance, Risk, and Compliance (GRC) software platform enables organizations to integrate and manage processes and data effectively, meeting company objectives related to governance, risks, and compliance management. Traditionally, most organizations use multiple GRC tools, such as Enterprise GRC, IT GRC, risk management, compliance management, policy management, and other tools to cater to their company-specific needs. However, the GRC market landscape is changing rapidly and users are increasingly looking at integrated solutions with a single framework to monitor and manage risks, reduce costs, and minimize complexities. All major GRC vendors offer comprehensive capabilities for effective governance, risk management, and compliance management solution for a wide-range of industry applications and regulatory requirements. Quadrant Knowledge Solutions’ recent study of the “Market Outlook: Governance, Risk, and Compliance (GRC) Platform, 2017-2022, Worldwide” analyzes market dynamics, opportunities and the competitive vendor landscape of the global GRC market. This study helps companies formulate growth strategies by identifying growth prospects, market trends, market drivers, and challenges in the global market. According to the research findings, the GRC market is expected to grow significantly from a market size of $4.32 billion in 2016 to over $10.21 billion by 2022, growing at a compound annual growth rate (CAGR) of 15.4% from 2017-2022. The market growth is primarily driven by ever-growing complexities of regulatory compliance, increasing concern for privacy and intellectual property protection, growing complexities of managing disparate risk & compliance initiatives, cybersecurity concerns, and significant growth of cloud, mobility, and internet of things (IoT) devices. The research also provides detailed competitive positioning and supplier landscape analysis of major vendors with integrated GRC platform, including Enablon, IBM, LockPath, LogicManager, MetricStream, Nasdaq BWise, Navex Global, RiskVision, RSA Archer, Rsam, SAI Global, SAP, and Wolters Kluwer Financial Services. Each of these vendors has comprehensive product offerings, strong value propositions to support diverse range of GRC applications, and market & technology strategies to support future market needs. As part of the research, Quadrant’s competitive landscape analysis compares vendors’ technological capabilities in providing a GRC platform and services in terms of technology excellence performance and customer impact. Performance in technology excellence is measured by parameters, including sophistication of technology, technology application diversity, scalability, competitive differentiation, and industry impact. Customer impact includes parameters, such as addressing unmet needs, product performance, proven records, ease of deployment, and customer service excellence. According to the research findings, Rsam with its advanced GRC platform capability, is positioned as the 2017 technology leader in the global GRC platform market. Rsam offers an integrated and configurable GRC platform with an adaptive framework suitable for a wide range of GRC applications, industry-specific solutions, and compliance requirements. The company uses a relational architecture and connected data model to facilitate dependencies and relationships within and between modules. The Rsam GRC platform is well known for its flexible and scalable architecture. It enables customers to use out-of-the-box configurations for speedy implementations as well as create their own custom solutions through its user friendly and intuitive drag-and-drop tool. Unlike traditional GRC solution, Rsam offers quick implementation. Users can start with their baseline configuration focusing on the most critical module and add additional modules later based on growing business requirements. Rsam offers a full-suite, integrated GRC platform with a spectrum of modules including audit management, business continuity, compliance management, exception management, policy management, regulatory change management, enterprise risk management, incident management, vendor risk management and security incident response. The company supports both on-premise as well as cloud-based deployments. Rsam is well recognized amongst its customers for its easy to use technology framework, faster implementation, and ability to support diverse use cases and industry specific applications. Audit Management: Rsam’s Audit Management module is a web-based, purpose-built solution that automates key processes and records its findings into centralized repository. Users can easily perform key functions of a risk-based audit, including planning, scheduling, resource allocation, workflow management, process tracking, reporting, global issue and remediation, and such others. Rsam platform help users in becoming audit-ready to meet stringent compliance requirements and its timeframe. It boosts efficiency and accuracy of audit management and facilitates smooth coordination between departments. Business Continuity Management (BCM): Rsam’s BCM module streamlines and automates processes for an effective business continuity program that helps organizations in reducing risk exposure and improve capability to plan and respond to an event. BCM module enable organizations to identify critical processes and assets, perform business impact analysis, analyze upstream and downstream dependencies of existing processes across related assets, and automate disaster recovery testing and crisis management. It also provides in-depth analysis and reports, heat maps, and metrics, including Recovery Time Objective (RTO) and Recovery Point Objective (RPO) to ensure informed decision making. Compliance Management: Rsam Compliance control framework help users in streamlining compliance management process with modules including risk & compliance assessments, financial controls management, control testing, FISMA, and HITRUST CSF. Rsam maintains a comprehensive content library of cross-mapped controls which are updated on a continual basis. Its compliance control framework takes aspects of each standard and converts them into customized measurable controls to meet industry-specific compliance requirements. The framework streamlines assessment reports and create findings that isolates problem areas. Exception Management: Rsam’s exception management platform help organizations manage and track accurate accounts of compliance exceptions, its status, and relevant details. It automates policy exception cycle and enable easy access of exception forms by anyone and routed to appropriate individuals for exception reviews, escalations, approvals, and renewals. These exceptions can be correlated with specific internal policies, standards, and compliance mandate to establish a renewal process based on changes occurred during the exception lifecycle. It also captures an audit trail and historical data to gain visibility into trends and full exception picture of the organization. Policy Management: Rsam platform’s Policy Management and Policy Attestation modules enable organizations to write, track, and manage policies centrally. Organizations can map and link these policies to comply regulatory standards, risk frameworks, and business objectives. With automated workflow and alert features, organizations can perform automatic policy updates, reviews, and approvals. This helps organizations to keep updated with changing compliance requirements and improve understanding of its risk position. Regulatory Change Management (RCM): Rsam’s Regulatory Change Management module provides a single customizable framework to manage complexities of evolving and emerging regulatory requirement and compliance processes. Organizations can establish a central repository of regulation intelligence to monitor regulatory changes applicable to their business and align business priorities. The information can be automatically routed to the subject matter experts for business risk assessment and its impact. It also helps in establishing workflow-based automatic remediation activities including review, approval, execution, and exception to maintain compliance. Enterprise Risk Management (ERM): Rsam’s ERM module enable organizations to establish a common risk taxonomy and centralized repository for risk-control and remediation activities across organization. Organization can share, update, and aggregate information from different operational systems and processes. It provides a comprehensive risk visibility and related dependencies across organization with its actionable roll-up and drill-down reports. Organizations can produce multiple results ranging from quantitative analysis to Monte Carlo simulations and scenario modelling. Vendor Risk Management: Use Rsam’s unique relational-data model to centrally record and organize all risk management data for a 360-degree vendor view. Identify the security and compliance controls and deficiencies for vendors with ease. Keep a risk inventory of vendors so you always have status at your fingertips. Broaden your assessment “picture” with easy integration to third-party sourced data — data that uncovers and exposes financial risk indicators, liens and judgements on the vendor, negative news coverage, and more. Security Incident Response: Incidents linger due to lack of automation, poor communication and siloed processes. Rsam’s Security Incident Response Platform (SIRP) puts your finger on the pulse of your incident landscape. Should an incident occur, Rsam Incident Management simplifies and speeds the triage, workflow and resolution. The company’s dynamic workflow can replicate any existing incident management process, and allows users to easily make changes as the process evolves. Organizations can integrate the SIRP platform with their SIEM and existing security tools for a complete view. Also, Rsam’s automation engine can immediately execute calls in other applications to ensure the fastest possible response time. The Global GRC market is highly fragmented. It has a presence of integrated full-suite GRC solution providers as well as vendors that offer domain-specific and point solutions providing coverage into specific applications for risk management and compliance management activities. However, driven by the growing challenges in collaborating vast data across departments with the presence of disparate systems, users are finding greater value in adopting an integrated GRC platform. Modern GRC software platforms offers robust, flexible, and scalable architecture enabling customers to quickly implement solutions based on their unique needs and business requirements. Integrated GRC platforms benefit organizations with improved transparency, corporate accountability, comprehensive risk visibility, and improved financial and operational efficiencies. Rsam, with its robust and flexible GRC platform is well positioned to help organizations integrate processes and systems for managing enterprise-wide governance, risk, and compliance management activities more quickly and efficiently. 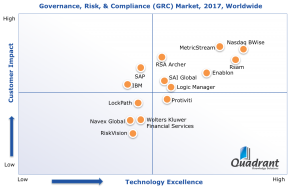 Driven by its innovative and comprehensive GRC capability and proven track records, Quadrant Knowledge Solutions identifies Rsam amongst 2017 technology leaders in the global GRC platform market. Rsam’s leadership position is driven by its performance in providing sophisticated technology platform, application diversity, scalability, and high customer impact.